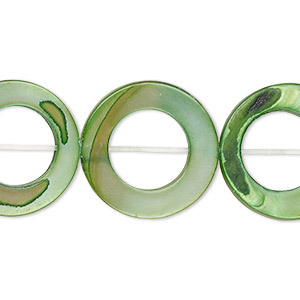 Bead, mother-of-pearl shell (dyed), green, 20mm round donut, Mohs hardness 3-1/2. Sold per 15-1/2" to 16" strand. Item Number: H20-7654NB Have a question about this item? 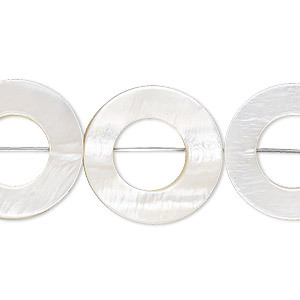 Mother-of-pearl shell donuts are economy grade--moderate cutting, drilling and luster. Testing for colorfastness is recommended. Colors, shapes and sizes may vary in each lot. 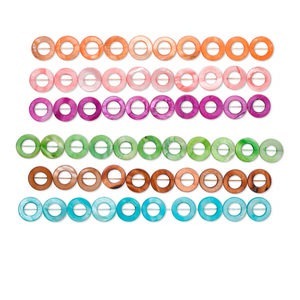 Bead, mother-of-pearl shell (dyed), assorted colors, 20mm round donut, Mohs hardness 3-1/2. Sold per pkg of (6) 15-1/2" to 16" strands. 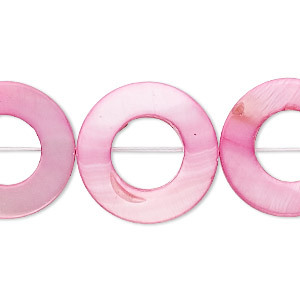 Bead, mother-of-pearl shell (dyed), pink, 20mm round donut, Mohs hardness 3-1/2. Sold per 15-1/2" to 16" strand. Bead, mother-of-pearl shell (bleached), white, 20mm round donut with 11.5mm center hole. Sold per 15-1/2" to 16" strand. 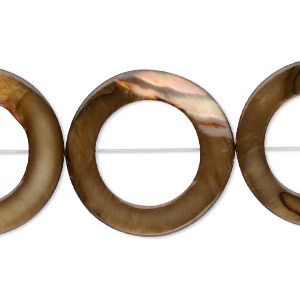 Bead, mother-of-pearl shell (dyed), brown, 25mm round donut, 15mm center hole, Mohs hardness 3-1/2. Sold per 16-inch strand. 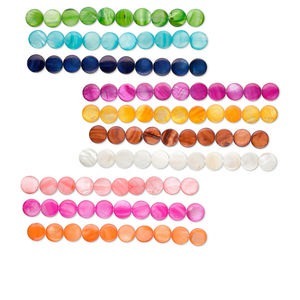 Bead, mother-of-pearl shell (bleached / dyed), assorted colors, 20mm flat round, Mohs hardness 3-1/2. Sold per pkg of (10) 15-1/2" to 16" strands. 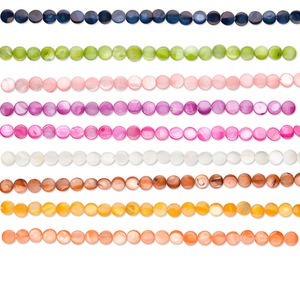 Bead, mother-of-pearl shell (bleached / dyed), assorted colors, 10mm flat round, Mohs hardness 3-1/2. Sold per pkg of (10) 15-1/2" to 16" strands. 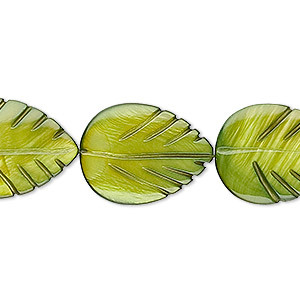 Bead, mother-of-pearl shell (dyed), moss green, 20x15mm carved leaf. Sold per 15-1/2" to 16" strand. 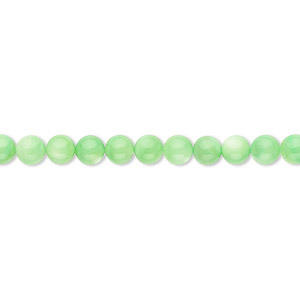 Bead, mother-of-pearl shell (dyed), mint green, 4mm round. Sold per 15" to 16" strand. 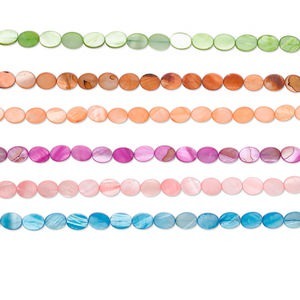 Bead, mother-of-pearl shell (dyed), assorted colors, 12x10mm flat oval, Mohs hardness 3-1/2. Sold per pkg of (6) 15-1/2" to 16" strands. 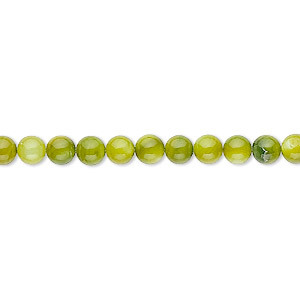 Bead, mother-of-pearl shell (dyed), moss green, 4mm round. Sold per 15" to 16" strand.